Go back 15 years and list the controversial games. Yes, there was Mortal Kombat, which proved that games were not for children anymore, but – whilst good – it was not truly “controversial”. For anything to be truly controversial, you have to completely divide your audience. Everybody realised that Mortal Kombat was violent, brutal and bloody. It didn’t divide the audience. Everybody understood it. To be controversial, people mustn’t get it. Controversy such as Monty Python. Controversy such as Brass Eye. Controversy such as Cannon Fodder. 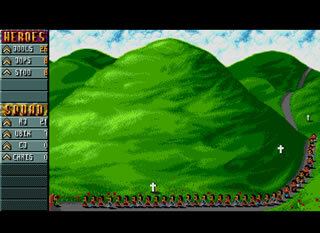 Cannon Fodder was released in the early 90’s by Sensible Software, and was so simple a three year old could pick it up. The game was mouse controlled, and you controlled your soldiers (upto 6, if I can recall) through missions. Rather than be select a soldier, point him to where you want to go, and let him defend for himself, you defend your whole platoon. Left mouse button moved your troops to where your cursor is, right mouse fires at your cursor, killing whatever is in the path. It’s fast, it’s furious, it’s fun. The missions are numerous, and varied, and become increasingly more difficult over time. Don’t worry, as there are extra weapons to obtain and vehicles to commandeer over time. Even with them, the controls are just as simple (a simple “hold down both mouse buttons” will fire off a rocket or a grenade), as the action is so fast, you can’t spend time changing betweeen weapons. This game is fantastic to play, it is fast paced action with great early 90’s graphics, a soundtrack ahead of it’s time and plenty to keep you busy. But most interestingly of all, it didn’t glamourise war. War was a horrible thing in the game, with gravestones of all your troops lost plastered upon the hillside, and the respects paid after a mission where some of your men didn’t return, with their names scrolled down the screen in silence. The fact that your soldiers can die slow, agonising deaths also, and the whole futility of war shown by the fact that both your soldiers and their soldiers are exactly the same. But it was still a game, and dark, ironic statements such as “War has never been so much fun!” and the fact it was simple and enjoyable to play managed to subtly pass the message that war is inherently a bad thing. Today, games that glorify war such as Medal of Honour don’t bat an eyelid of the major papers, it’s ironic that the most controversial game about war was made as to attack war itself, not to defend it. Maybe if we all played Cannon Fodder, there wouldn’t be any wars in the first place. One of my favourite games of all time, this one. Absolute classic. a great example of a developer getting all of the basics spot-on. It was simple to get into, straightforward to play, but it didn’t stop Cannon Fodder from being surprisingly tactical and led the way for real-time tactics games. Pixellated strategy may have devolved into base building, but there are still a few RTT games out there where tactical skill makes a difference and they owe a hell of a lot to this game! every year around christmas i play a few levels of this all-time-classic. LOVE IT! 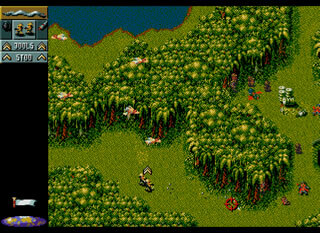 there was never again a game like this one (except the not so good and much too hard cannonfodder 2), i never understood why there are no actual rip-offs of cannonfodder and syndicate, another great game of that era that was in some way unique.